A “Tummy Tuck”, or abdominoplasty, is performed by Dr. Potter to flatten protruding abdomens, tighten the muscles in the abdominal wall and remove excess fatty tissue and skin. This surgical procedure is a common one and can benefit men and women who are bothered by a protruding abdomen. A protuberant abdomen can be a cause of distress for men and women alike. It can be the result of excess fat, weak abdominal muscles, pregnancy, or loose skin that has been over-stretched and no longer responds to diet and exercise. For those who have experienced a massive weight loss, their only alternative to loose overhanging skin is surgery. Patients whose weight has been stabilized in their weight loss program or who feel they are at their ideal weight are the best candidates for a tummy tuck. Many patients combine their tummy tuck with other cosmetic procedures such as liposuction, breast augmentation or breast reduction surgery. 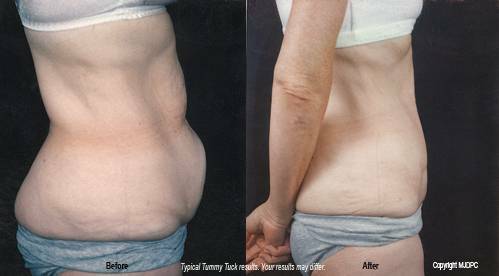 Could you benefit from a Tummy Tuck? During your private consultation with Dr. Potter, you should explain your goals and expectations of the surgery. He will assess the nature of your abdomen, your expectations, and explain the probable outcome of your procedure. You may be shown several before and after treatment photographs of patients having similar abdomens, and our surgeon will explain the treatment and the results you can expect to receive. Before and after photographs may be taken of your abdomen to document your improvement. There are three basic techniques used to flatten a protuberant abdomen. The best technique for you will depend largely on your goals and your specific problem. Liposuction alone can produce a thin abdominal wall for some. If your laxity and excess skin is below your navel, a mini tummy tuck may be right for you. For those with severe laxity of their abdominal muscle or excessive skin, a full tummy tuck may be the solution. A tummy tuck is usually performed on an out-patient basis under general anesthesia with the patient asleep, or with spinal anesthesia. A full tummy tuck involves an incision around the belly button and another incision that runs from hip to hip. Your entire abdominal wall is tightened with permanent sutures, and the excess skin and fat is removed. A mini tummy tuck is usually performed in conjunction with liposuction of the upper abdomen and the flank areas. With a mini tummy tuck, a smaller incision is made in your bikini area and no incision is made around your belly button. Dr. Potter will remove your excess skin and fat through this incision. Permanent sutures will also be placed through this incision to tighten the muscles of the abdominal wall. Regardless of which procedure you have, your incisions are closed with small sutures. Small drains may also be inserted to eliminate fluid buildup. Snug elastic bandages are then applied to the area. What will my recovery from a Tummy Tuck be like? After Dr. Potter performs your tummy tuck, most patients experience some numbness in the area of their abdomen, which may last as long as a year. Any pain or discomfort that follows surgery can be controlled with oral medication. If drains are used, they may remain in place for 3 – 7 days until discharge fluids decrease. Sutures will be removed in 1 – 2 weeks, however, your bandages may remain a little longer. A special abdominal support garment is often necessary for several weeks. There will be some scarring that will fade significantly over time. During your recovery, you must refrain from any strenuous activity or lifting. Most patients are back to work within 1 – 3 weeks, depending on the degree of surgery. Dr. Potter will decide when you can resume normal activities. Results can be quite dramatic, and patients love their slimmer, trimmer figures and flatter abdomens! Site developed by MJD Websites. All trademarks are property of their registered owners. Procedure Content Copyright © 1994 - 2015 MJD Marketing, Inc. All rights reserved worldwide. Reproduction of any portion of this website on any digital or other medium without prior written consent of MJD is strictly prohibited. Photographs are models for illustrative purposes only. Before and after photographs may not be patients of the doctor featured in this website.